My guest on the Girlfriend's Cyber Circuit Lit Blog Tour today is Marilyn Brant, author of the smart and clever debut novel According to Jane, from Kensington Books. The story begins one day in sophomore English class, just as Ellie Barnett's teacher is assigning Jane Austen's Pride and Prejudice. From nowhere comes a quiet "tsk" of displeasure. The target: Sam Blaine, the cute bad boy who's teasing Ellie mercilessly, just as he has since kindergarten. Entirely unbidden, as Jane might say, the author's ghost has taken up residence in Ellie's mind, and seems determined to stay there. Jane's wise and witty advice guides Ellie through the hell of adolescence and beyond, serving as the voice she trusts, usually far more than her own. Years and boyfriends come and go--sometimes a little too quickly, sometimes not nearly fast enough. But Jane's counsel is constant, and on the subject of Sam, quite insistent. Stay away, Jane demands. He is your Mr. Wickham. Still, everyone has something to learn about love--perhaps even Jane herself. And lately, the voice in Ellie's head is being drowned out by another, urging her to look beyond everything she thought she knew and seek out her very own, very unexpected, happy ending. . .
As a former teacher, library staff member, freelance magazine writer and national book reviewer for Romantic Times, Marilyn has spent much of her life lost in literature. She received her M.A. 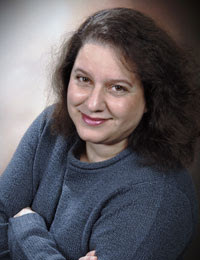 in educational psychology from Loyola University Chicago, dabbled in both fiction and art at Northwestern University, studied the works of Austen at Oxford University and is an active member of the Jane Austen Society of North America. Her debut novel won RWA's prestigious Golden Heart Award® in 2007. Marilyn lives in the northern Chicago suburbs with her family, but she also hangs out online at her blog "Brant Flakes." When she isn't rereading Jane's books or enjoying the latest releases by her writer friends, she's working on her next novel, eating chocolate indiscriminately and hiding from the laundry. (I hear you, Marilyn). Marilyn stopped by to answer a few questions... (more than three, which seems to be my favorite number). Name three songs that would be perfect for the soundtrack of your book. I can only name three?? I use an ‘80s soundtrack through the entire novel and songs of that era play a significant role in the story so I'd choose “True” by Spandau Ballet, “Make Me Lose Control” by Eric Carmen and “You Give Love a Bad Name” by Bon Jovi, but there are so many. What was the inspiration behind the writing of According to Jane? Who are the top three writers who have influenced your writing style? Some entertaining Austen-inspired fiction, like Beth Pattillo’s Jane Austen Ruined My Life, and the amazing Shaffer/Barrows book The Guernsey Literary and Potato Peel Pie Society. Listening to and playing music, traveling, spending time with my husband, son and our extended family, having long conversations with friends over coffee, watching old movies and reading late at night. Describe how you got your first book deal. 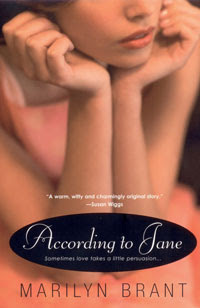 According to Jane had won the 2007 Golden Heart Award for “Best Novel with Strong Romantic Elements,” but the chronological story structure had thrown off a few editors because they weren’t sure how to market the book--as YA or women’s fiction. I restructured the novel to make it clear that it was women’s fiction, and my agent submitted it to John Scognamiglio at Kensington in April of 2008. He read it and made us a 2-book offer 12 days later. I will always adore him for that (!!) but, also, he’s proven to be an excellent editor. Don’t follow trends just because you think it’ll be an easier sell. And write the books that fit your voice. If what you love writing happens to be a hot-selling genre, great. If your writing voice happens to be perfect for the genre you want to write in and love to read, that’s awesome, too. But--if not--write long and hard enough to find what DOES fit you and your style best. Because then, even if it takes longer to make that first sale than you expect, you’re writing the kinds of stories you most enjoy, and that passion has a way of working itself into the projects you’re creating. Thanks for the great advice, Marilyn! Be sure and visit Marilyn's Web site here. And be sure and keep a look-out for her second forthcoming novel about three suburban moms who shake up their lives and their marriages (October 2010), also from Kensington Books. Thanks so much for touring me this week, Wendy! It's been such fun to visit you here :). Best of luck with "Jane!"